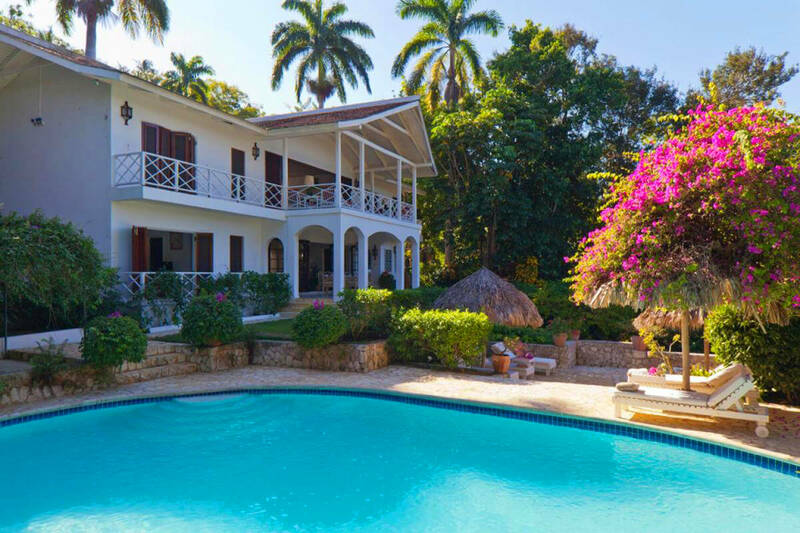 A part of Jamaica’s luxurious Tryall Club, Serenity Villa is a beautiful stay for up to six guests that has you vacationing in high-class Caribbean style. With plenty of space for everyone in your group, Serenity provides an elegance that is hard to match, especially with its formal and casual living rooms, well appointed kitchen, dining seating on both the verandah and pool deck, and three bedrooms that all show off scenery of the property’s landscape and nearby ocean. And did I mention the staff? Serenity has a cook, housekeeper, laundress, and gardener. Get around the Club properties on the provided golf cart, or I would recommend hiring a driver if you want to really explore the Island. Villa Serenity sits high on Copperwood Ridge, surrounded with landscaped gardens and bright, tropical flowers. This charming villa is remarkable with its soothing ambience of elegant Caribbean style. Its two living rooms bring the outdoors inside with its flowing, open-air plan. The formal living room located upstairs is ideal for special occasions. The more relaxed sitting room downstairs is decorated with a hand-painted mural created by a renowned Jamaican artist. There are two bedrooms located upstairs off the living room and one bedroom located downstairs. All bedrooms are air-conditioned and open out to sun-kissed tropical views and the Caribbean Sea. The master bedroom is furnished with a king-sized bed while the two guestrooms are furnished with two twin beds each. The spacious stone pool deck with an inviting, oval swimming pool takes full advantage of the panoramic views of the gardens, golf course and Caribbean Sea beyond. This is an ideal spot for casual dining in the company of family and friends. For more elegant meals, dining may be arranged on the verandah. When Lady Lorna Howard named the house Serenity she did so because she regarded it as her sanctuary and it lives up to its name! Serenity is pleased to provide its guests with the use of a complimentary golf cart. Your private, welcoming villa staff is comprised of a superb team of one cook, housekeeper, laundress and gardener. Serenity also has cable television and internet access.